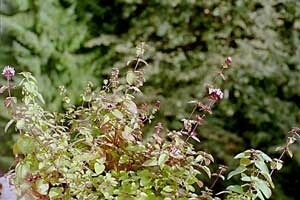 Oregano is a hardy perennial that will winter over in most gardens. It is also a commonly used herb, especially in Italian recipes. This is a guide about growing oregano. Oregano is one of the most valuable culinary herbs to grow in the garden. Unlike its relative, Sweet Marjoram, Oregano is a hardy perennial that will over winter in most zones if protected. 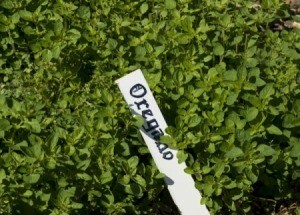 Oregano's woody stems grow into bushy mounds of aromatic green or gold-colored foliage up to 2 feet tall. The foliage is topped with spikes of small, pretty pink flowers that various beneficial insects like bees and butterflies find hard to resist. Oregano will grow in almost any type of soil as long as it has good drainage. Seeds should be sown the late spring into warm soil (60ºF) or started indoors and transplanted when temperatures reach 45ºF. Oregano is often grown as an annual, but will can be grown as a perennial in cooler zones if protect with mulch over winter. Trim flowers and remove dead wood to keep plants looking neat. As they age, plants may start to become woody and less attractive and should be divided as necessary or replaced with new plants. Leaves and stems can be harvested as soon as plants reach 4 inches. Cut tops of stems down to the first 2 sets of leaf pairs. Plants will respond by sending up new shoots. Freeze leaves or hang them to dry in a dark or shady location. Keep dried leaves in sealed containers when storing. Marjoram's honey-scented leaves are their most flavorful just as flower buds are starting to form.